If you had found this bottle, would you have broken it open right away? Why or why not? 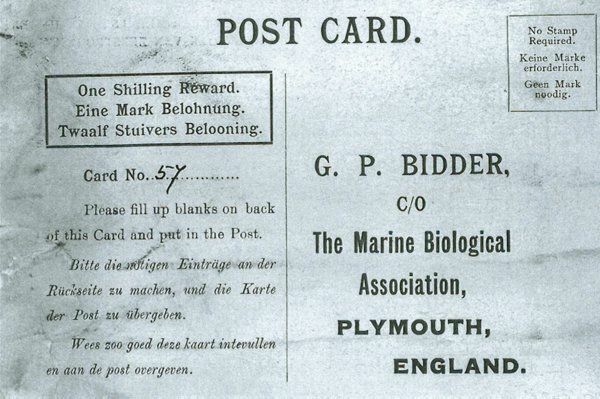 Why do you think the people at the Marine Biological Association were so excited to get the postcard from the bottle? What, if anything, do you think the people at the Marine Biological Association can learn from a bottle that's been floating in the North Sea for more than 108 years? In 1906, George Parker Bidder dropped weighted bottles into the North Sea to study the direction of its currents. What kinds of technology do you think marine biologists use today? What topics do you think they study? Have each student take out a piece of paper. Tell students to imagine that they could travel back to the year 1916 and talk to someone their age. Instruct them to make a list of things they'd like to learn about that person's life. Encourage them to consider topics such as news, current events and even how people complete mundane tasks on an everyday basis. Invite students to share their ideas with the class. Create a master list of the most frequent items or topics mentioned. Point out that these are quite likely the same things people living 100 years in the future would like to know about how they live in the year 2016. Instruct students to select their favorite topics from the master list. Then have them write a letter to someone their age living 100 years from now. Encourage them to include plenty of details and examples so the person receiving their letter understands what it's like to live in the year 2016. Recommend that they review articles on the Teen Tribune website for ideas about current news events. Invite students to read their letters aloud to the class. After all letters have been read, challenge students to identify the overall impression the letters would make on someone reading them 100 years from now. What would they think about life in 2016? Divide the class into small groups. Have each group write a letter. Instruct them to include at least one news item, one current event and one explanation of how they complete an everyday task. Tell them to include details and examples that match the overall impression they'd like to make on the person reading their letter. Divide the class into pairs. Have partners work together to write a letter. Instruct them to include at least three news items, three current events and three explanations of how they complete everyday tasks. Tell them to include details and examples that match the overall impression they'd like to make on the person reading their letter. Divide the class into pairs. Have partners work together to identify the lasting impression they'd like to make on the person reading their letter. For example, do they consider 2016 to be an optimistic year? Or do they have a more pessimistic view of the world based on current events? Once partners agree on a focus, instruct them to write a letter. Challenge them to include several news items, current events and explanations of how they complete everyday tasks. Each example should support the overall impression they'd like to make on the person reading their letter. Instruct each student to select one adjective that they think summarizes the overall mood of 2016. Then have students write a letter to someone their age living in the year 2116. Encourage them to identify and describe important news items and current events that have occurred this year. Tell them to also describe mundane tasks they do every day. Challenge students to craft their letters in a way that all examples support the overall mood they identified before writing their letters. The lessons in this issue of “Art to Zoo” encourage students to think about the interaction of clothing and society, both past and present. Students focus on clothing in the 19th century and its reflection of middle-class ideals. The science fiction literary genre isn’t meant to predict the future. But read this Smithsonian article to learn how the implausible ideas that fire inventors’ imaginations often, amazingly, come true. Read this Smithsonian article to learn how travel in the 1860s differed from travel today. The lessons in this issue of “Art to Zoo” allow students to “visit” 18th century Philadelphia. Students become “time tourists,” reading a detailed description of the city sights, following a map and meeting various people on the tour. In this Smithsonian activity, students learn how to tell a story from the point of view of someone who lived in a time depicted in a museum exhibition. This Smithsonian IdeaLab shows teachers how to incorporate artifacts and documents into the teaching of U.S. history. Although designed as a companion to the Advanced Placement Program U.S. History course, the ideas presented here are effective in any instructional setting that emphasizes analytical thinking and writing. In this Smithsonian unit, students use the methods of archaeology to identify and interpret artifacts from a contemporary setting.